The lab activity described here was developed by Erin Bardar of TERC and Betsy Youngman for the EarthLabs project. In this culminating activity, students will contemplate what the future might hold for climate and the cryosphere. In the first part of the lab, they will learn about what climate models predict Earth's climate will be like in the future. In Part B, they will consider potential changes in sea level that might be brought about by warming temperatures and melting ice. Comparison of hothouse and icehouse Earth extremes. What does the future hold for climate and the cryosphere? 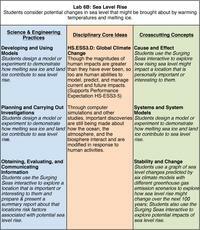 In Part A: Students first learn about climate models and how they are used to create climate scenarios. They then take an interactive questionnaire about how individual lifestyle choices play out in a scenario and subsequent climate. After discussing how such lifestyle choices impact global climate, studets use the Climate Wizard tool to explore future climate scenarios for the U.S., focusing on a location that is important or interesting to them. Part A concludes with a class discussion about potential future climate scenarios and how they could impact students' lives. Students are encouraged to come up with their own way to show how melting sea and land ice will contribute to sea level rise. They should find that sea ice does not contribute significantly to sea level rise because sea ice floating in ocean water displaces approximately the same amount of water as it contributes to the ocean when it melts. To model sea ice, float a few ice cubes in a glass, bowl, or small aquarium tank of water. Mark the water level on the side of the container or add enough water so that the water level is even with the top edge. Place the container in direct sunlight or under a lamp so that ice cubes will melt relatively quickly. Monitor/measure any changes to the water level as the ice disappears. If you use freshwater, the ice in the glass will not cause the water level to rise when it melts. When frozen and floating, ice displaces enough water to support its mass. When the ice melts, the added volume of water is the same as the volume that was displaced by the floating ice. In the oceans, sea ice expels salt when it freezes, so the ice itself is essentially freshwater ice. However, it is floating in salty water, which is denser than freshwater. Because the freshwater ice is less dense, it floats higher and displaces less water than it would if it were floating in freshwater. Therefore, when the ice melts, it contributes a slightly greater volume of melt water than it displaced when it was frozen. This means that melting sea ice can have a small, but real contribution to sea level rise. The land ice model must begin with the ice being completely out of the water. For example, you could place a rock or wooden block in the bottom of a bowl or small tank to represent a land mass. Pour some water into the container so that the water level is slightly below the top of the "land". Mark the water level on the side of the container. Place a few ice cubes on top of the "land" and put the container in direct sunlight or under a lamp to melt the ice. Monitor/measure any changes to the water level as the ice disappears. Glaciers or ice sheets, which are not in the oceans, will add volume to the oceans and increase sea level when they melt. Some degree of melting can also cause land ice to break off and slide into the ocean, which can contribute to sea level rise as the added ice displaces ocean water. Therefore, melting land ice has a much more significant impact on sea level rise than does melting sea ice. Watch this video to see a simulation of how the melting of ice shelves and ice sheets affects sea level. After completing their models, students interpret sea level rise data and use the online interactive Surging Seas to explore threats from sea level rise and storm surge to all 3,000+ coastal towns, cities, counties and states in the continental U.S. Students will choose a location of interest to study in detail and prepare a short report to share with the class. 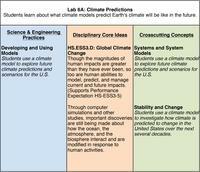 In Part A:: Prepare yourself to facilitate discussions about climate predictions and consequences. Purpose of the discussion: This discussion is meant to get students thinking about how the choices we make as individuals can can add up to create large-scale change. Facilitation Tips: Write the primary discussion questions on the board and give the students time, in small groups of 3-5 students, to brainstorm and recall events they may have heard about in their own area. If you suspect that they may have difficulty identifying local events, either discuss the examples here, or ask students to research events with their families or other resources as homework and then continue the discussion a second day. 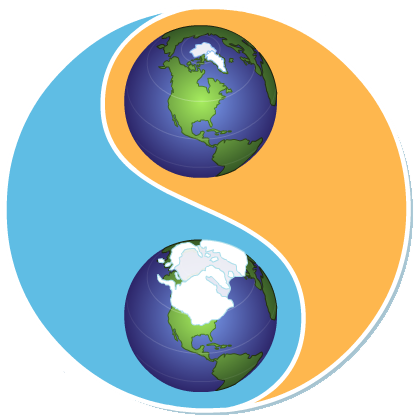 Primary discussion questions: How do individual lifestyle choices influence global climate change? Can one person really make a difference? Brainstorm and share ideas for changes in your lifestyle that you and your classmates and families can make. Wrap Up: Suggest that students try making one or two of the changes they came up with in their brainstorming for a few weeks or months to see if they can observe any impact on things like their home heating or electric bills. Purpose of the discussion: This discussion is meant to get students thinking about the future and how their lives will be impacted by climate change. How old will you be in 2050, 2080? How much will the temperature in most of the United States have changed by 2080? Give several examples of how the increase in average temperature could impact your daily life. Wrap Up: As you wrap up the discussion, bring students back to thinking about the cryosphere and how the predicted changes they observed for their local region would impact snow and ice. In Part B: Consider assigning specific locations for small groups of students to explore with the Surging Seas interactive. Suggestions for how to use Student Notebooks for Lab 6. Have students write down the learning objectives for Lab 6. In Part B: Have students draw the model they build to demonstrate how melting sea ice and land ice contribute to sea level rise. Explore background information and content extensions related to Lab 6. For additional background information about climate change, read this NASA article on global warming. "Ice becomes liquid water when warmed to its melting point. Conversely, liquid water changes state to become ice when cooled to its freezing point. Earth's polar regions consist largely of ice, and exhibit dramatic changes in ice coverage in response to seasonal changes in temperature. An increase in temperature resulting from global warming could drastically affect the extent of polar ice. Whether those changes would cause sea level to rise depends on whether the ice is continental ice or floating ice. Continental ice (such as glaciers and ice sheets) raises sea level as it melts. This happens because when ice on land melts, it adds water into the ocean that was not there before. This extra water raises sea level. For example, if the West Antarctic ice sheet melted, sea level would rise by at least 5 meters. That is a significant amount; even a rise of just one meter would displace roughly 100 million people along coastlines. Floating ice (such as ice shelves, icebergs, and sea ice) would not have much effect on sea level. According to a physical concept known as Archimedes' principle, a floating object displaces an amount of water equal to its weight. In other words, floating ice displaces a volume of water approximately equal to the volume of water it would contribute as it melts; therefore, when floating ice melts, there is very little change in sea level. However, although the melting of floating ice doesn't significantly affect sea level, there are other consequences. Variations in salinity and temperature drive global ocean circulation because of density differences; fresh water is less dense than salt water and warm water is less dense than cold water. This thermohaline circulation is sometimes referred to as the great ocean "conveyor belt" because it is one of Earth's main mechanisms for transporting energy. The formation of sea ice, which is primarily made of pure water, leaves behind salt in the water beneath the ice, resulting in saltier and colder water that sinks through the water below it, thereby promoting circulation. When ice melts, it adds fresh water to the ocean, decreasing salinity and affecting the circulation pattern. Any change to ocean circulation could have damaging effects on the water cycle and weather patterns. In addition, a change in the temperature or salinity of ocean water disrupts habitats and could have harmful effects on marine life forms that are sensitive to such changes. The loss of sea ice in polar regions also threatens the survival of certain species, such as the polar bear, which depend on the ice for hunting and breeding. Furthermore, ice shelves act as buttresses, keeping glacial ice from reaching the ocean. Even if melting ice shelves would not increase sea level directly, the barrier that prevents ice sheets from sliding into the water would be gone, and the melting ice sheets would increase sea level." Fact Sheet: Sea Level and Climate: "Global sea level and the Earth's climate are closely linked. The Earth's climate has warmed about 1°C (1.8°F) during the last 100 years. As the climate has warmed following the end of a recent cold period known as the "Little Ice Age" in the 19th century, sea level has been rising about 1 to 2 millimeters per year due to the reduction in volume of ice caps, ice fields, and mountain glaciers in addition to the thermal expansion of ocean water. If present trends continue, including an increase in global temperatures caused by increased greenhouse-gas emissions, many of the world's mountain glaciers will disappear. For example, at the current rate of melting, most glaciers will be gone from Glacier National Park, Montana, by the middle of the next century (fig. 1). In Iceland, about 11 percent of the island is covered by glaciers (mostly ice caps). If warming continues, Iceland's glaciers will decrease by 40 percent by 2100 and virtually disappear by 2200. Most of the current global land ice mass is located in the Antarctic and Greenland ice sheets (table 1). Complete melting of these ice sheets could lead to a sea-level rise of about 80 meters, whereas melting of all other glaciers could lead to a sea-level rise of only one-half meter."